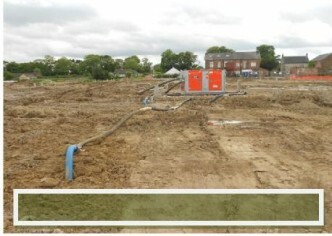 SLD were invited to look at a potential Wellpoint dewatering project at a site in Leeming Bar, Northallerton to enable a construction of a rising main. 2. Due to the small diameter sewer pipe to be installed, this would be a fairly rapid installation for the customer, which would be severely impeded by our relatively slow installation rate of conventional vertical wellpoints. Following site visits, the decision was made to propose a solution for this project using horizontal wellpoint dewatering. As the name suggests this is an alternative type of dewatering system with the suction points laid horizontally below ground, as opposed to the more common vertical configuration. Pope Bros commenced installing the terram wrapped wellpoint filter to both side of the pipe track, in 50m lengths and to approximately 2.0m below ground level, with a tail brought to the surface at one end of each length to facilitate connection of a dewatering pump. Through a series of special adaptors that allowed for trimming/controlling the air/water flow through the lines we were able to connect up to 4 x 50m lengths per pump, with a total of 6 pumps eventually on hire. The system has proved to be a success, with Leehill able to install pipes in dry conditions at a pace to suit them. The dewatering had the added bonus of drying the ground enough to enable the dump trucks to move up and down the spread without fear of sinking to their axles in mud.